One of my latest brag books was released yesterday on the RRD blog. This one is using a kit called Sunflower Susie from Raspberry Road Designs. 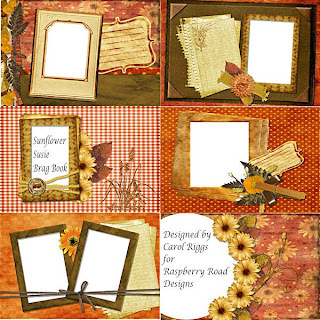 You can pick up this brag book freebie by going to RRD and downloading it. Pretty simple, huh? Better yet, while you're there grab a copy of the kit. Susan's prices really affordable and her kits are simply gorgeous! If you do download it, please leave a comment on Susan's blog or the 4shared site. We love reading what you have to say! I wondered if you would like to join my topsites for those who create scrap freebies. If you would like to add your site, you'll find the banner in my side bar.